The designers at Valve aren't particularly prolific when it comes to games, but what they lack in volume they more than make up for in passion and polish. While big titles like Portal and Team Fortress soak up most of the fame, small projects like Alien Swarm are an even better showcase for the qualities that set this studio apart from the competition. 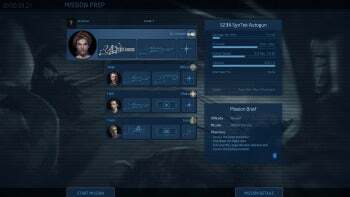 Alien Swarm team members have specialties. Choose weapons loadouts wisely. Started years ago as a mod for Unreal Tournament 2004 before being taken in-house by Valve, Alien Swarm is a Source-engine based isometric shooter that emphasizes teamwork and cooperative play over solo run-and-gun bravado. In a setting lifted almost intact from the Aliens book of tropes, you are part of a team working your way through a futuristic base infested with the titular ETs. Each squad member has a special skill and progress is predicated on use of these abilities at key points in order to continue. Whether it be computer hacking, heavy weapons skills, welding doors shut or cutting them open, healing wounded comrades, setting ammo resupply points or dropping flares, your team has it covered, assuming you're skilled enough to keep each of them alive long enough to use those abilities. Alien Swarm's level layout is beautifully rendered and cleverly accomplished. Lighting is especially well-handled, with long evocative shadows that convincingly invoke a suspenseful, foreboding mood. Sound effects and game mechanics are satisfying and solid, with crisp control reaction and the ability to use a gamepad if the traditional WASD and mouse controls leave you flatfooted. Narrow corridors are inconvenient in workplaces, but handy when fending off swarming aliens. 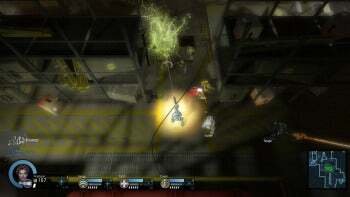 The wave attack dynamics employed by the creatures encourage the use of small-unit tactics that pay off handsomely when properly utilized. Controlling bottlenecked access corridors with crossfire and reserving the auto-aim heavy cannon ammunition for more pitched battles will save your life frequently. Pacing in Alien Swarm is steady but not frantic, allowing you to think a bit before the click fest begins in earnest. As good a game as it is, there are some minor problems with Alien Swarm. Avoiding friendly fire is an important aspect of the game, but it remains frustratingly easy to gun down your own team whether you're playing with a group cooperatively or practicing alone with bots. This is a design decision issue and not easily fixable. Also, the grainy, simplistic rendering used for the title screen could use some of the visual fireworks that are lavished elsewhere, as the low-budget impression it leaves is misleading. Last of all, this game requires Steam to both download and play. Steam may be the best DRM system around, but it's still a DRM system. It's astonishing that a game of this pedigree and polish is free. Alien Swarm offers more features and fun than similar titles which make you pay for the privilege of playing them. Do yourself a favor, head over to Steam and add this slick mini-classic to your library before the folks at Valve come to their senses and start charging real money for it. Note: The Download button takes you to Steam, where you must register for a Steam account to download this software.